Professionalism, innovation, and talent animate the director, producer, and founder of the Actors Workshop, Jacques Maroun. An unconditional theater lover, he graduated from the University of Texas and New York City’s Actors Studio Drama School. He presents at Black Box Beirut, his recent opus Al Wa7ech, an adaptation of Danny & the Deep Blue Sea by the American John Patrick Shanley. As usual, the artist tells Prestige about his impressions. Why this title, Al Wa7ech? This play concerns me personally. When I choose a work, I do not aim to attract only the audience. I am a fan of tough theater, which I try to communicate to the general public as much as possible. The choice of Al Wa7ech is a diminutive of the original title Danny & the Deep. This is the name of Dory’s character, who is actually called Al Wa7ech. The majority of your plays are an adaptation of foreign works. Why? Personally, I am neither a novelist nor a playwright. This is why I rely on human and universal themes, written by famous playwrights that I appreciate and respect. In 2012, Reasons to be Pretty was an adaptation of the work of American Neil LaBute. 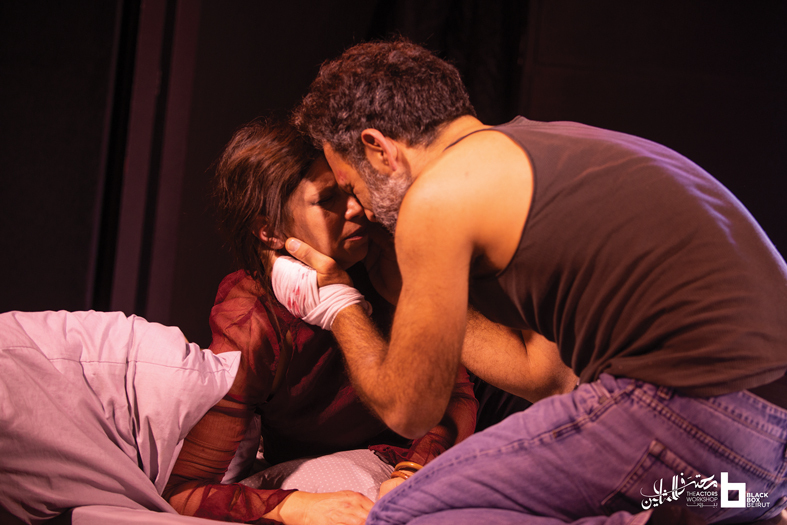 In 2014, Ka3eb 3aleh or Spike Heels was also a modern adaptation of George Bernard Shaw’s Pygmalion. In 2015, Venus was adapted from David Ives’s «Venus in für». In 2016, Faradan Inno was a play written by Alan Arkin. And this year, I chose Danny & the Deep Blue Sea, an adaptation of the play written by John Patrick Shanley. Why did you choose this play specifically? In fact, I had met John Patrick Shanley in 2012 in New York as I was preparing to present Reasons to be Pretty. I then told him of my intention to work on the play Al Wa7ech, especially since I appreciated the texts of this Oscar winner and very popular in the United States. He is not only known for his plays, but also for his blockbuster movies, like Moonstruck or Doubt. His style is realistic, direct and black, with remarkable psychological fluidity. Before the official opening, you invited the public to the performance of the play as part of the Actors Workshop. Why? The Actors Workshop has always been open to students and theater lovers since its foundation, but the presence of the public was missing. As I have always wanted to do «Soft Opening» before the official opening of the performances, we decided to invite the public to the Atelier, which is an artistic house but also a real laboratory for tests, because this kind of representation gives us the opportunity to train ourselves fully in the presence of the public, without being criticized, and to correct any errors. In New York, plays are played for a whole month before the official opening. It is a Western cultural custom that allows actors to train thoroughly in front of the public. What, in your opinion, will be the reaction of the public? I decided to open a new page in the Actors Workshop. From the moment the doors of the Workshop have been opened to the public, this place will be his. For the past seven years, the workshop has been my private domain, my artistic scene, my refuge. A space of creation and cooperation shared with my team, but also a meeting place for Atelier members, students, and actors. The responsibility becomes heavier in the presence of the public. I do not know what will happen. This unknown worries me both positively and negatively. However, one thing is certain: I am happy to see the audience attend, evaluate the show and discover a completely different scene where these two deserving actors, Carole Abboud and Dory Samarani evolve. Your themes are deeply human, going to the depths of human being. Is this the case in this play? In this play, two characters live in pain. It’s a tragedy, which does not necessarily lead to death. I like tragedy, whereas the public prefers comedy. All Lebanon suffers. In this play, we treat this social evil through two people of strong personalities, although coming from an identical cultural background, they are at the same time different. The romantic touch of their love story moved me deeply. I appreciate this strong romance torn between two antagonisms. The storm lives in me. Your theater is called daring … Indeed, my plays are according to my image. They look like me. I like adventure, taboo subjects, daring. Boldness is newly brought to the theatrical or cinematographic scene. Previously, the director was more traditional, seeking to work safely. What kind of difficulties do you fear? Creativity often springs from an unfortunate artist, while fortune is likely to make him less productive. A successful and profitable show will encourage him to present more beautiful plays, and to engage more stars. Benefits from the artistic field are not bad. The artist needs money to be able to better educate himself. Whether dedicated to the general public or to a smaller one, the theater is theater. And the one who evolves on the stage is an artist. Only there is a commercial art worthy of respect and a mediocre and a banal art. My theater reflects my respect for myself, the public, and the works presented. Censorship prohibited your plays to those under 18 years old. What about Al Wa7ech? This year, censorship gave me a gift by banning the play to those under 16 years old. We insist to submit the play before each performance, to have permission to play. A continuous dialogue is established with officials to cancel censorship on the plays specifically. We also call to issue laws that would be in tune with our popular culture.